Racetrack Playa is a dried-up lake located in Death Valley, California, USA. This dry lake is notable for its sailing stones, which are known also as sliding stones, rolling stones, or moving rocks. The sailing stones are a geological phenomenon that has been observed since the early 1900s. Although they have been studied for a long time, no one has managed to provide an adequate explanation for this curious phenomenon. Recently, however, a team of scientists have succeeded in (partially) unravelling the mystery of the Racetrack Playa Sailing Stones. 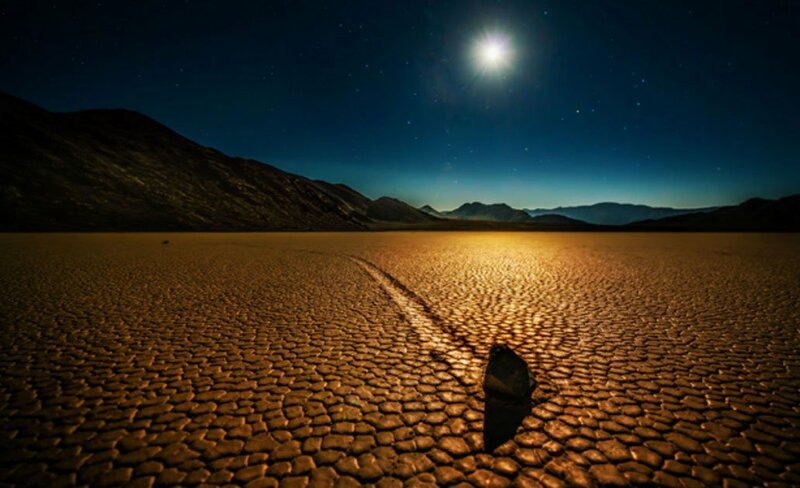 Sailing stones are recorded to exist in other parts of the world as well, though those of Racetrack Playa are the most famous. The sailing stones are named as such due to their apparent movement over the dried bed lake of Racetrack Playa. As a result of the stones’ movements, trails, which may stretch for hundreds of meters, are left behind them in the cracked mud. These trails are the only indication that the rocks move, as no one is known to have actually seen the stones move in person. This geological phenomenon has been known by humans since the early part of the 20th century. In addition, research has been conducted over the decades in an attempt to explain how these stones could move on their own. Various hypotheses have been put forward, though some more plausible that others. Some people, for instance, attribute the movement of the sailing stones to aliens, whilst others claim that the stones have magical properties. Yet others have speculated that the stones move due to magnetism, or as a result of mysterious energy fields. Other researchers have carried out experiments to test the validity of their hypotheses. For example, in 1948, two geologists, Jim McAllister and Allen Agnew, proposed that the stones were able to move as a result of dust devils, in combination with the dried lake’s intermittent flooding. This hypothesis was tested four years later by another geologist. For the experiment, a stretch of the lake bed was soaked, and a plane’s propeller was used to create strong winds, which simulated the dust devils. The results were inconclusive. Apart from wind, another popular hypothesis is that ice was the cause of the stones’ movement. One experiment to determine if ice was the culprit was conducted during the early 1970s. Two geologists, Robert Sharp and Dwight Carey visited the site twice a year, and meticulously recorded the movement of 30 stones. They planted wooden stakes around the stones, speculating that if ice sheets were responsible for the stones’ movement, the ice would freeze to the stakes, stopping the stones from moving. In spite of this, some stones still managed to move. In 2006, a planetary scientist by the name of Ralph Lorenz was setting up a series of miniaturized weather stations in the Death Valley as part of a project with NASA. It was during this project that Lorenz came to know about the sailing stones and decided to have a go at solving this mystery. Lorenz reviewed the scientific literature for other instances of rocks moving on their own, though in environments different from that of the Racetrack Playa. He learned that ice, being buoyant, helped float rocks onto Arctic tidal beaches. This idea was then applied to the sailing stones of Racetrack Playa. Lorenz and his team observed that some of these trails looked as though one stone had hit another and was somehow repelled, or bounced off. The scientists then hypothesized that this may be possible if the stone had a ‘collar of ice’ around it. To test this, Lorenz decided to conduct an experiment using a small stone, a Tupperware with water, and a tray of water with sand at the bottom. The stone was placed in the water, with a bit of the stone sticking out. This was then placed in the freezer, so that the water could form a collar of ice around the stone. The stone was then flipped, so that its un-iced part was on the bottom, and placed in the tray. When the ice was gently blown, the stone moved quite easily, leaving a trail in the sand. The team also calculated that under certain winter conditions in the area, this hypothesis might actually work. What is the Secret Behind Gravity Hills? Nevertheless, this seems to work only with the small stones, and the movement of the big ones (some weighing more than 300 kg (661.39 lbs. )), has not been fully explained yet.